It looks like an Indian Four and it rides like an Indian Four, but this motorcycle has never been anywhere near Springfield, Massachusetts. Sitting in the frame is a one-liter NSU car engine, mated to a four-speed gearbox and shaft drive from a European pre-war motorcycle. The frame is a one-off, built to accommodate the tall SOHC engine; on a genuine Indian Four frame, there’s an additional straight tube running under the gas tanks. 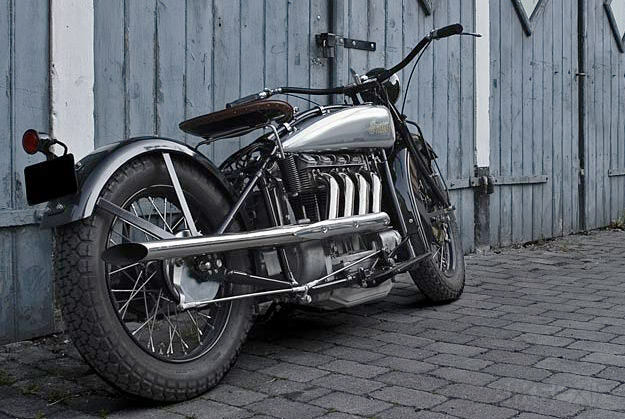 But the look is just right, helped by a vintage 1920s headlight and a repro Indian front end and fenders. The detailing elsewhere is lovely: the tanks, flywheel housing and engine sump are beautifully cast in aluminum. The forms for these were made by owner/builder Mads Bartholin, who spent literally hundreds of hours on those three parts alone. Bartholin is an industrial designer and this project took him eight years—rather than the two he anticipated—partly because he was perennially broke, and partly because he got married and had kids along the way. The Alma Four apparently handles well, given that it’s based on a vintage American behemoth. And thanks to the air-cooled NSU Prinz engine, reliability is not an issue. (The motor was also used in the Münch Mammut, by the way.) 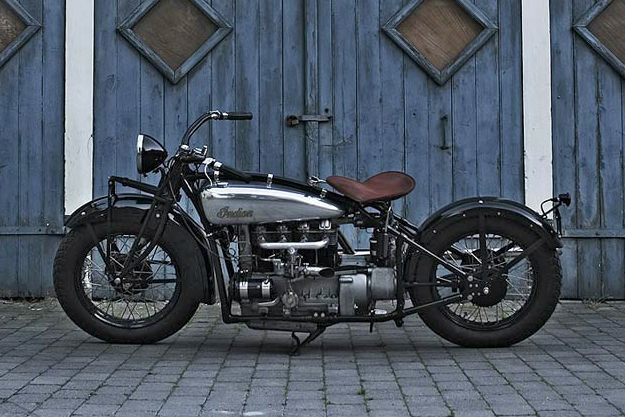 Purists may scoff, but there’s something oddly appealing about this motorcycle. It’s a mix of vintage and modern componentry put together with great skill and a sensitive eye. And there’s something to be said for a bike of any description that starts first time in the morning. With thanks to Kim Scholer. Photographs by Jeppe Sorensen. See more about this bike on The Vintagent.